Today marks the 26th anniversary of the death of Laura Palmer. It also marks one year since I was lucky enough to talk to Sheryl Lee about her iconic role. The original purpose of our interview was for Rue Morgue magazine’s cover story on the 25th anniversary of Twin Peaks. As happens, we didn’t have space to us the entire interview in the magazine so I thought, what better day than today to share the complete and unedited piece with all of you. Special thanks, of course, to Sheryl Lee, for talking to me that night, and to Dave Alexander at Rue Morgue for first asking me to do the piece in the first place. I hope you enjoy it! In the world of Twin Peaks, February 24th 2014 marked the 25th anniversary of Laura Palmer’s murder. As fate would have it, that night I found myself on the phone with Sheryl Lee, the actress forever immortalized as a beautiful corpse, wrapped in plastic. Gracious, warm and charming, she spoke lovingly about her time in Twin Peaks, her colleagues and David Lynch, the man whose art would turn Lee into an icon. Andy Burns: How did you wind up on Twin Peaks? Sheryl Lee: I was living in Seattle at the time, studying with a theatre director. That’s what I wanted to do; I wanted to do theatre. I had an agent just for commercials or video auditions, stuff like that, to help pay the bills. I got a call one day that David was in town and that they were going to be filming a very secretive television pilot around the Seattle area and would I come in and meet him. And that was kind of it. I went in and I met him and he talked with me about how I would feel about being wrapped in plastic and playing a girl that was already dead and doing a few flashback scenes. It was a very short shoot at that time, doing flashbacks and then a few days of work as a corpse. David was so nice and funny and charming and warm, that I felt comfortable with him immediately. Andy Burns: You guys just connected right way? Sheryl Lee: I felt that way, but I think he has that kind of personality where he’s just a really kind human being, and he connects with the people he’s speaking to. He’s warm that way, and you feel it when you meet him. Andy Burns: When you walked onto set that first day, what was that like for you? Were people welcoming? Sheryl Lee: People were welcoming. For me, I’m painfully shy by nature, so still, whenever I walk onto a set for the first time, I’m nervous, even after doing it all these years, because it’s a new group of people. But then, I had no reference point to what TV was like, but playing a corpse, you get a really good education. You learn to just lay there, and I was like a sponge; I got to soak it all up. Sometimes it was like they were speaking a different language, when they were speaking about blocking and camera lighting. I didn’t know any of that stuff. But everyone was really kind; you couldn’t have asked for a better group of people. Andy Burns: I find that so interesting, because I’ve lived with your work for so long and not just with Twin Peaks, but the John Carpenter film you did (Vampires) and Backbeat, and I’ve always thought of you as a brave performer, so to hear you talk about being shy, it’s not something I ever would have guessed. Sheryl Lee: Thank you so much. I can tell you I’ve been lucky, like in Fire Walk With Me, to have David there, I mean, he pulls stuff out of you that you didn’t even know was there. He creates and environment that is so safe, and you know that you can jump off that cliff because there are calm, still waters at the bottom. He’s very supportive and you want to do your best for him. You want to give him everything you have creatively because he is so brilliant. I trust his vision. Andy Burns: That’s got to be such a big thing when you’re playing such a vulnerable role as Laura in Fire Walk With Me. You’ve got to be able to trust who you’re working with because it’s so intense. Sheryl Lee: Yes, and he and I, by the time we did Fire Walk With Me, Twin Peaks had already aired, so we already knew each other. So when he approached me about Fire Walk With Me, he and I would meet and have coffee or have dinner, and figure out, where was Laura living at this point, emotionally, spiritually? What’s going on? So through the course of those conversations, my trust grew more and more and more. Andy Burns: It’s a very surreal film. The tv show was too, but the film takes it in a bit more of an intense direction. When you’re working on a film like that, do you feel, for lack of a better word, the “weirdness” of it as an actor, or is it not as surreal because you know who you’re working with and you have the trust of your director. Did it feel weird at all? Sheryl Lee: That’s such a great question. I can’t believe of all the questions I’ve been asked over the past 25 years, nobody has thought to ask me that (laughs). I love that you asked me that! You know, there were times on that film that it definitely felt surreal and, forgive me, because in my mind, in my internal creative space, its very difficult to separate the series from the film because it’s all one story. So sometimes I’ll be speaking with someone about the film and I’ll be having memories from the series, or vice versa. It’s still Laura and it’s still Laura’s parents and it’s still Laura’s life. But yes, many moments on the series and on the film where I was like, “Wow, that’s happening today?” Or, one of the things I love so much about David and the way that he directs is that, sometimes through your logical mind it doesn’t make any sense, but if you surrender to his world, you’ll realize that what he’s done is created a mood. Just to give you an example, there was a scene on the TV series where I was playing Maddy and I was sitting in the diner with Lara (Flynn Boyle). And it was cold and rainy and we were drinking coffee. And David’s direction was along the lines of, “Ok, it’s 1950 and it’s summer and you’re drinking milkshakes.” Well, it wasn’t 1950, it wasn’t summer and we weren’t drinking milkshakes. But he goes and tells this whole thing and then says “Action!” Now, if you’re going to try and make sense of that with your logical mind, you’re not going to be present to the moment. But if you surrender to wherever it is he’s taking you, than by the time he says action, you realize that he has taken you somewhere. He’s taken you exactly where he wants to take you and he starts the scene from that place. It’s like a brushstroke that he’s just painted across you. And then, when you’re in the world with him for a while, you get that this man really is brilliant. For me, logically and with my mind, I can sort of develop certain aspects of a character, but when it comes to playing that character, there’s a surrendering that has to happen, a letting go. I have to get out of the way so that the energy of that character can express itself through me, and that is not a logical mind process. Andy Burns: On that note, how much did Jennifer Lynch’s book, The Secret Diary of Laura Palmer, help you to develop that character? Sheryl Lee: Oh, it helped tremendously. Part of my education as an actor was to write bios for my characters, and of course, I didn’t write anything as eloquent as Jennifer did. But just the little notes I had taken about who Laura was before I played her, it was so synchronous. I hadn’t told anybody. I felt like Jennifer was in my head, meaning Laura’s head. And I always feel this intimate connection with Jennifer because of that. There’s something there that connects us, having experienced that character that way. Andy Burns: I read the book when I was 13 and I read it one way, and then I read it again as an adult and I took something new away with. It’s the same with the show. You can watch it as a quirky series one time, and then the next time, you can view the way it does things so differently than any other show. At the time you had Dallas or Dynasty and their nighttime soap opera family interactions, and then you have Twin Peaks, with families acting unlike anything you’d ever seen before. Sheryl Lee: Oh my gosh! And can we, just for a minute, talk about the brilliance of Grace Zabriskie and Ray Wise. I’m still in such of awe of both of them. I still feel like I got to work with master actors. And both of them have this ability to go as dark as you possibly go, and as light as you can possibly go. The palette is infinite for both of those actors. And to sit at their feet and watch them and work with them the way I was blessed to do; they were two of my greatest teachers. Still are. Andy Burns: Do you remember playing the scene when we find out who killed Laura Palmer? Sheryl Lee: When I was Maddy, being killed again? Sheryl Lee: (Laughs) That scene, I remember very well. That might have been one of the longest days of my whole career. We had to film Maddy’s death scene with three different actors, because David didn’t want the crew to know who killed Laura either. So we filmed it once with Ray, once with (Richard Beymer’s character) Ben Horne, and once with BOB, Frank Silva. That was all on one day. It was a brutal day. Andy Burns: It’s got to take an emotional toll, I would think. Sheryl Lee: It really does. I had a brilliant doctor tell me that the only part of an actor that knows that they’re acting is their mind. So, if you’re crying real tears, your body still goes through the chemical response of real tears. If you’re acting afraid, if you’re feeling fear, which most actors are in that moment, than whatever chemicals are released when your body is afraid, the adrenaline, all that stuff that goes on, it really does take a toll on your system. Andy Burns: To me, and a whole world out there, you’re an icon. Long after we’re both gone and the world changes but art lives on, you’ll still have created a character that’s already stood the test of time and that’s going to continue to do so. Is that difficult to fathom at all? Sheryl Lee: First, I have to tell you, again, nobody has ever asked me that question in the twenty-six years of doing interviews, so good on you (laughs). You’re coming up with these awesome questions. And I honestly have never thought about it in that way. Even though I played Laura, there’s a part of me, well, most of me, that is completely separate from her. So I don’t think of myself as an icon or anything like that, I think of that character and that show. It doesn’t really have anything to do with me. I was there and I filmed it and I brought whatever I could to it, but it’s almost like, I painted a painting and gave that painting to somebody else and the painting lived on, but I went ahead and died. It’s that piece of art that lives on, and I was fortunate to be a part of that piece of art, but that it’s not me. But I’m grateful that I was a part of it. 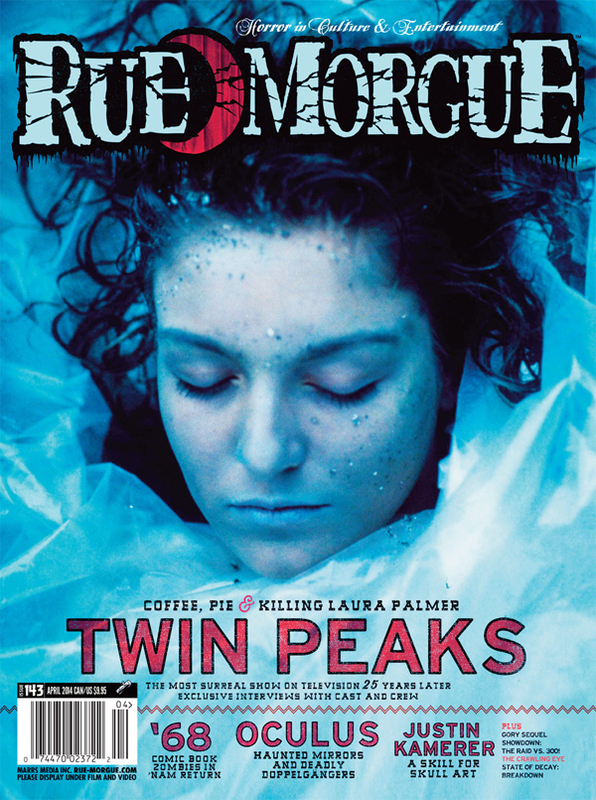 Back in March 2014, I was very privileged to write the cover story to Rue Morgue #143, featuring Laura Palmer on the cover. It was interesting how that all turned out. I originally pitched Editor-In-Chief Dave Alexander on another story, one that was essentially a year in advance (that one is still in the hopper so I won’t say what it was). 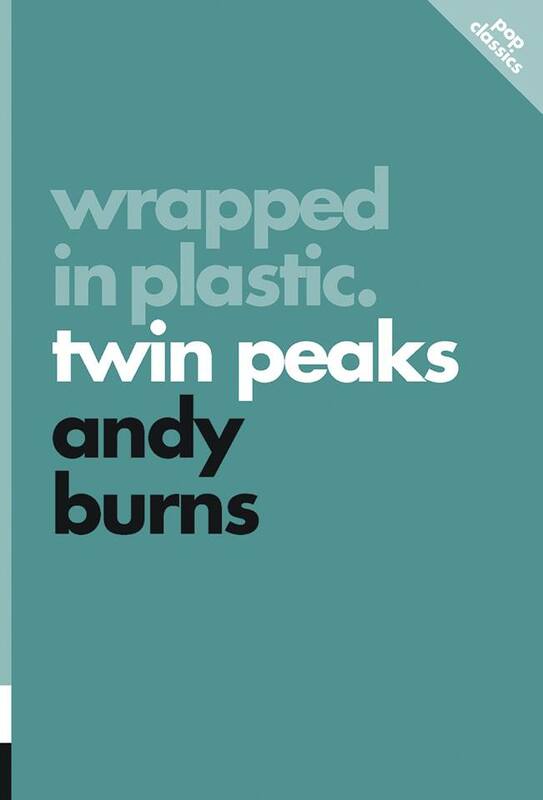 In my pitch letter, I ran down my CV for Dave, including mention of Wrapped in Plastic: Twin Peaks. When he got back to me, he asked if I would be interested in doing a story on TP. I jumped on the chance, which I only had a few weeks to do. Amazingly, many of the interviews came together very last minute, but turned out very well. Last night, while searching YouTube to see if anyone had posted clips from our Twin Peaks panel from this past weekend at Fan Expo, I came across this review of Rue Morgue #143. It says a lot of great things about the issue and the article in particular, and I thank Jacob Breuer for the nice words. I’m back at my hotel room, having ended my first day at Twin Peaks Fest a little early. I decided to skip out on the screening of Fire Walk With Me, since I’ll be attending the screening in Toronto that Rue Morgue is putting on for Fan Expo’s Festival of Fear at the end of the month, and rather than sitting in the movie theatre I figured I could actually do some writing. The first day was quite fun. Driving in from Seattle, the highway to North Bend is absolutely gorgeous – the mountains and trees were truly something to behold. There were a few times where I wanted to pull out the camera while on the road, but I’m smarter than that. To be honest, my initial feeling when I walked into the meeting hall for the fest was one of discomfort. There were certainly people who knew one another, and for a few minutes I felt like an outsider. However, I think I started to loosen up; as well, I was wearing my “We’re Going To Need A Bigger Boat” t-shirt, which wound up serving as an excellent conversation starter with more than a few people. What I soon realized is that if you’re willing to talk, everyone attending is happy to talk back. Makes sense, right? We’ve all travelled varrying distances because of our love of Twin Peaks, so we all have at least one thing seriously in common. That being said, I didn’t compete in the Twin Peaks trivia contest for fear of failing at minutia trivia – I actually would have done pretty well, at least for the first few rounds, but truthfully, I don’t know which hand Cooper uses to when using his dictaphone (though in my mind’s eye, I see him being a righty), and I thought there would be questions like that (there really wasn’t). I also had a chance to talk to Brad Dukes, a Twin Peaks expert who has just released Reflections: An Oral History Of Twin Peaks, which is exactly as described, and is beautifully put together. I’d say with Brad’s book, a thorough and extensive history of the show, and mine, which as you’ll see come February analyzes the show while placing it in pop culture context, you really won’t need anything else on your library shelf (hopefully I won’t be the only one who feels that way). Rob, who puts together the fest with his wife and lots of other friendly folks, was a nice fellow to speak with; he took some Wrapped In Plastic: Twin Peaks post cards which people will be able to pick up on Saturday, so that was very kind of him. 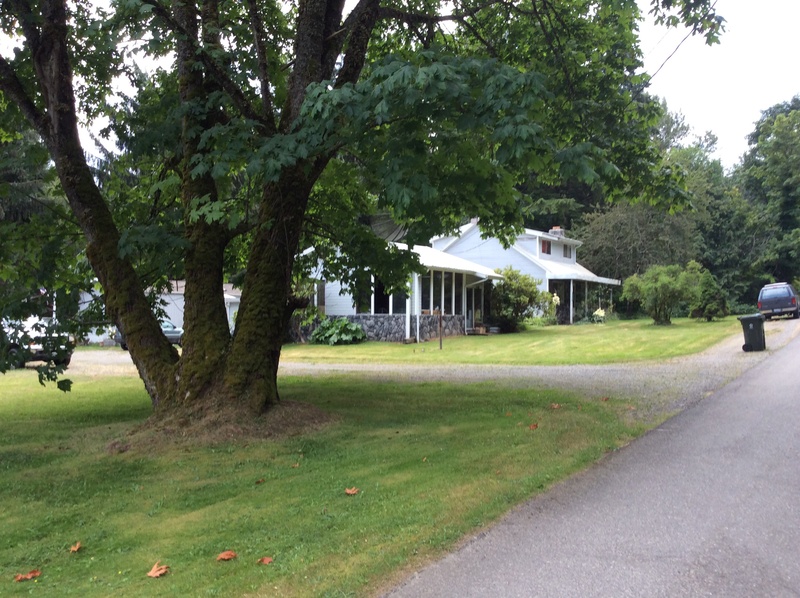 Following the sign-in, I joined a caravan of about four or five cars over to where the exterior and interior of Leo Johnson’s house was shot for both the pilot and Fire Walk With Me. Honestly, this was worth the price of admission alone, as the owner of the house, an older gentleman named Dave, actually came out and told the bunch of us the story of how David Lynch came to use his house as Leo’s. The best part of the story in my mind was the fact that Dave watched only five minutes of the pilot before deciding it wasn’t his cup of tea. He’s never seen it since. 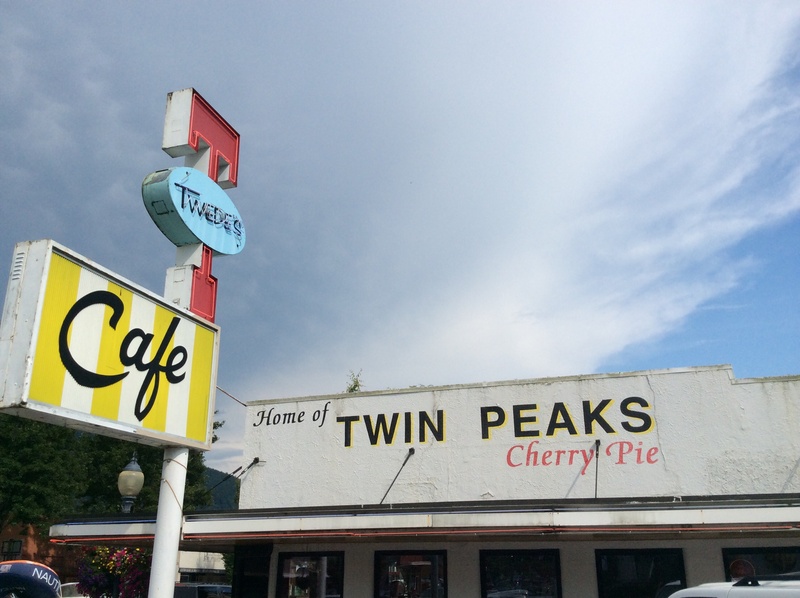 I checked into my hotel, but soon drove back into downtown North Bend to eat at Twede’s, the basis for the Double R Diner, where I had clam chowder, a Monterey Burger, fries, and of course, cherry pie and coffee. And damned if that cherry pie wasn’t absolutely fantastic. I anticipate a few more slices before the weekend is over. The evening of films began with some short pieces, along with the arrival of the TP celebs who were on-hand, including Charlotte Stewart, Chris Mulkey, Wendy Robie and Kimmy Robertson, who had some very kind words to say about my Rue Morgue article on Twin Peaks which I interviewed her for earlier this year. As mentioned, I decided to skip out on the Fire Walk With Me screening, as I’ll be taking the early morning bus tour and figured I should get some shut eye. Hi there and welcome to Wrapped In Plastic: Twin Peaks, the site for my forthcoming book on the series, to be published in February 2015 by ECW Press. My plan for this particular site is to share updates as we head towards publication. This being my first book, it’s been an interesting trip seeing it come to fruition, and I plan on including info on the whole process here. I’ll also be updating the site with transcripts of the various interviews I conducted with Twin Peaks alum for both Wrapped In Plastic: Twin Peaks, and the cover story I did for Rue Morgue magazine in March 2014. The article turned out very well and hopefully fandom enjoyed it, but, unsurprisingly, there’s lots of content that couldn’t make it into the finished article and sidebars. This will be the place to find them. 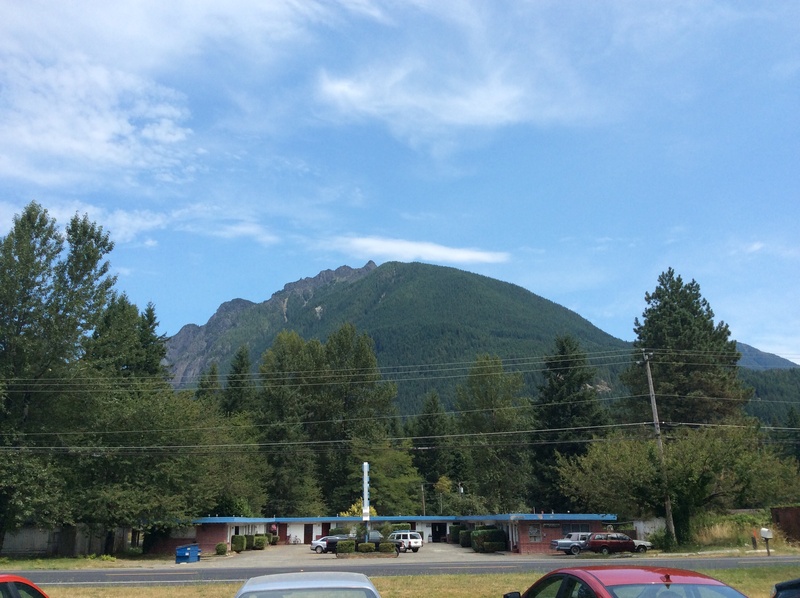 Coming up first, though, is my trip to North Bend for the Twin Peaks Fest. I’m psyched to be going and seeing the sites, and also meeting all the other fans that are making the trek as well. I’ll be sharing my travels both here and with the folks at Rue Morgue as well, so be sure to check in for those updates at the end of the month. Until then, see you in the sycamore trees!